Two-time winner Murray only recently returned from an 11-month absence, but 36-year-old Williams is seeded 25th after giving birth last September. Williams has been granted a discretionary seeding by the tournament's organisers. 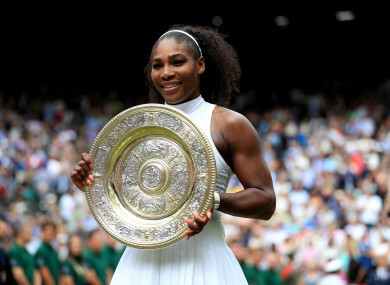 SEVEN-TIME WIMBLEDON champion Serena Williams has been seeded 25th for this year’s women’s singles by the organisers, despite being ranked 183rd in the world. The 36-year-old – who was not seeded for the French Open – has made only a tentative return to action following complications during daughter Alexis Olympia’s birth last September. In contrast, Britain’s two-time Wimbledon champion Andy Murray has not been seeded in the men’s singles although he has returned to action in the past fortnight. The 31-year-old spent nearly 11 months off the court due to a hip injury and then a subsequent operation, has not committed himself to play at Wimbledon as of yet. This year’s French Open champion Simona Halep is the women’s top seed, with Swiss legend and eight-time Wimbledon champion Roger Federer the men’s top seed. Email “183rd-ranked Serena Williams seeded for Wimbledon, Andy Murray misses out”. Feedback on “183rd-ranked Serena Williams seeded for Wimbledon, Andy Murray misses out”.